Where do I use my Art Gallery voucher code? Choose a code you would like to use, click it and follow the link to the Art Gallery website. Add your art to your basket and when ready view your basket. You can now enter your code before proceeding to checkout (see above). Complete your order and your discount will be applied to your total. "Check out the Special Offers section for the latest money-saving offers." Art Gallery is designed to provide outstanding and high-quality pieces to prospective art owners at affordable prices. Purchasing art can be expensive and sometimes, time-consuming which is why Art Gallery have collated an abundance of established artists bringing you best of British art right to your screen! No more traipsing around art galleries to find your perfect piece, everything you love is just a click away available from the comfort of your own home. With such a wide array of different options and ways to search, it’s so easy to find something that’s perfect for you at Art Gallery. Payless with NetVoucherCodes too when using one of our online deals and make the most out of Art Gallery shopping experience. 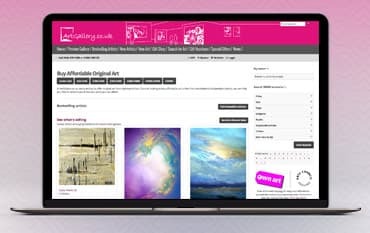 Whether you’re looking for original art, limited edition or open edition prints, you can refine your search at Art Gallery using filters such as subject, style or size to ensure your requirements are met. Prices at Art gallery range from just a few pounds to up to £2000 - there is something to suit every budget. If you want to stay ahead of the times and keep in the know on the latest pieces, we advise you check out the New Artist category to discover upcoming artists. At Art Gallery, you can also find a stunning collection of handmade pieces in the beautiful Gift Shop. Featuring small sculptures, handcrafted cards, homeware and much more! Using an Art Gallery Discount Code from us could also guarantee you great savings at the checkout meaning you can get something unique and original for a lot less. Featuring some of the UK’s top makers, the selection is a nay gift buyers dream. Whether it’s for a birthday, special occasion or simply to say thankyou, the Art Gallery Gift Shop is an exciting place to find something original and authentic, like nothing they have received before. Delivery charges (within the UK) are included in the price of the artwork. They are not added on afterwards. The price you see on the screen is the price you pay. How can I sell my pieces through Art Gallery? If you are interested in selling your work through artgallery.co.uk please visit the artist's information page for further details. How can I contact Art Gallery? To contact Art Gallery please contact 0844 879 7438 or 01666 505152. If you’re on the lookout out for something beautiful and unique to add to your home or office, an original work of art is a fantastic addition. At Art Gallery, you can grab stunning pieces which come directly from the artist's studio and boast a portfolio or bestselling artists. Using one of our Art Gallery Discount Codes which you find here at NetVoucherCodes, you can save money on the art you love and fill your home or work for less. Bring some life to your space with something that reflects who you are or what you stand for - you’re guaranteed to find something you love from the Art Galleries abundance of established names and upcoming talent.